An accident reconstruction vehicle for the Colorado Highway Patrol, a 3D-printed habitat for astronauts on Mars and a public restroom for the Mount Everest trekking route are among the student design projects that will be on display at this spring's Capstone@Mines Design Showcase. The annual event - the culmination of a yearlong client-driven design experience for seniors - will be from 9 to 11 a.m. April 25 at Lockridge Arena. 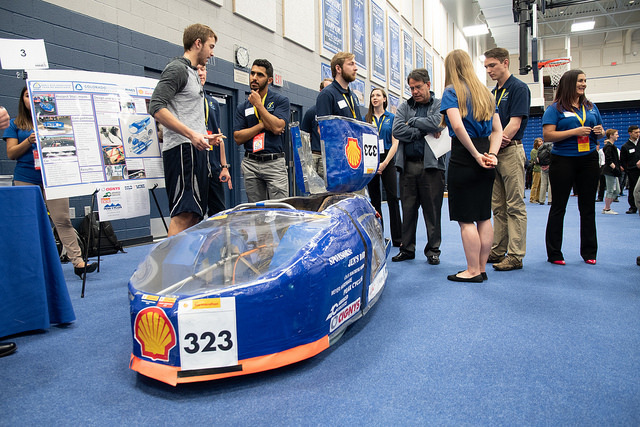 More than 55 student teams from Mines' civil, electrical, mechanical and environmental engineering departments will display their projects, all designed to tackle real-world challenges faced by industry, government agencies and community organizations. First-, second- and third-place prizes will be awarded, as well as recognitions for innovation, societal impact, proof of concept and professionalism. A pair of noise-canceling headphones designed for a former state trooper who suffered a traumatic brain injury took the event's top honors last semester. For more information about Capstone Design, go to capstone.mines.edu.